William Hamblin and Daniel C. Peterson have a regular religion column in the Deseret News. Their latest article is entitled “Pilgrimage: A sacred journey in search of God.” They point out that many religions have their own types of pilgrimages towards a holy place, shrine, or temple, where the pilgrim seeks to connect with God. Truly, the Temple Mount, or current location of the Dome of the Rock in Jerusalem, is such a location for several major religions. Latter-day Saints also have pilgrimages to temples. Many members of the Church throughout the world still have to travel great distances, over a number of days, at the cost of lifetime savings, to reach the closest temple to their home. In recent years, this has improved as temples have been built in more locations, closer to more members. The temple itself can also be considered a pilgrimage within itself, a journey from a lower sphere to a higher one, even heaven, where one comes to God. Most pilgrimage is associated with special rituals and ceremonies. Pilgrims are often required to don sacred robes and undergo spiritual exercises such as prayer, reading scriptures or meditation. Many pilgrims abstain from ordinary activities of life by fasting, sleepless vigils or sexual abstinence. Sacrifice or offerings are often required of the pilgrim, even if it is only placing of a flower or rock in a special place. In return many pilgrims obtain tokens of their pilgrimages — special clothing, jewelry, books, medallions or relics — which they proudly wear or display as symbolic of their spiritual status as pilgrims. It’s been a long time coming, since September 2008 to be exact, and I’d like to finally complete this series of posts on the seal of Melchizedek. It is probably one of the most trafficked series of posts on this website. It’s drawn a lot of attention, and may have even been part of what compelled a BYU scholar, Alonzo L. Gaskill, to publish an article about it in The Religious Educator at BYU in 2010, which article I’d like to talk about. But first, there are a few other artifacts related to the symbol that I’d like to share. As I pointed out in Part 2, this seal is most prominently found as displayed in the mosaics and iconography in the basilicas of Ravenna, Italy. Indeed, this is very likely where Hugh Nibley saw this symbol originally, as perhaps did Michael Lyon, and where he may have coined the name the “seal of Melchizedek.” The symbol is shown on the altar cloths in these mosaics, shown next to Melchizedek, Abel, and Abraham, in making sacrificial offerings to God. The altar cloth also shows gammadia in the corners, right-angle marks like the Greek letter gamma, which is also very interesting, and worthy of a study in and of itself. Location of Solomon’s Temple, 2: Which Jerusalem? Tradition has held that Solomon’s Temple, the first permanent temple that the Israelites built in Jerusalem around 968 B.C. and destroyed around 587 B.C. 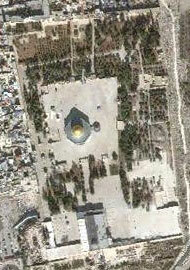 by Nebuchadnezzar, was located on the same site as the modern-day Muslim mosque, the Dome of the Rock. A new archaeological team made up of Garth Norman, Lance Harding, Jason Jones, and John Pratt who have been studying the subject for several months propose that the original temple might have actually been located between the modern Dome of the Rock and the Dome of the Tablets. They propose that Solomon’s Temple could be rebuilt, the Third Temple, on its precise original location without disturbing the standing Muslim mosque. At least 20 other locations have been proposed for the site, including Margaret Barker’s last Monday, so it will be interesting to see how this new theory is accepted. Some of the evidence this new theory presents seems somewhat unconvincing to me, such as the “pillar base.” Could a pillar base from Solomon’s Temple really have survived intact on the temple mount since 587 B.C.? What have other scholars proposed as the purpose of this stone, which stands out in the middle of the otherwise flat temple mount? If that is where Solomon’s temple originally stood, and the pillar base is intact, would we not also see some evidence for the exterior or interior walls? The question has been asked, and could be asked again, if the Third Temple has to be built directly on the first temple site at all, or only near it. What do you think about this latest theory?